Rangers' decision to make their final bid for David Goodwillie as he was having his medical at Blackburn has been described as "absolutely crazy". And Dundee United chairman Stephen Thompson says that Rangers had never made a written offer for the striker. "Their final bid was a great bid, there is no doubt about that," Thompson told BBC Scotland. "But the player was down having his medical at the time. It was absolutely crazy." Goodwillie finally joined Blackburn in a deal worth £2m immediately, with potentially more than £800,000 in add-ons. But a series of bids from Rangers prior to the striker heading for a medical with the English top-flight outfit failed to match Rovers' offer. "It certainly felt like a saga and it was a stressful last four or five days," said Thompson. "But the must important thing for me was getting the right deal for Dundee United. "We took what we believe was the best offer for Dundee United Football Club. "I still feel that was the best deal and so does the rest of the board." Reports have suggested that Rangers feel aggrieved that their final offer failed. "I don't want to get into an argument with Rangers," said Thompson, who said he would leave it to others to decide whether the Glasgow club's bid arrived too late. "I have no issues with Rangers at all. "It was verbal, through Ally Russell, who I know very well. He phoned me. "We never received anything in writing or by email as nothing was ever agreed. "Every club had an opportunity to come in before the deal was done and we took what we believed was the best deal for our club." 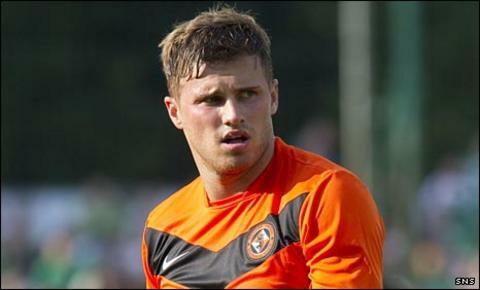 Thompson was hopeful that Goodwillie, the latest product of United's youth system to become a full Scotland international, would become a big hit in the Barclays Premier League. "I wish David all the best," added the United chairman. "I think he is a really exciting talent. "He is only 22 and, if he kicks on, who knows, there might be more money in the future for the club. "It is a good deal and a great opportunity for a young guy to go and play in the top league in the world."